In reading Michael Horowitz’s “Defensive Computing” blog on ComputerWorld this morning (it’s entitled “Windows 7 Restore: less trustworthy than XP?” I was reminded how things can go wonky in a hurry when Microsoft changes its rules for system behavior. And for those who didn’t follow along from XP to Vista and thence to Windows 7, some of those rule changes can lead to some nasty surprises along the way. Case in point: automatic system restores in Windows 7. As Horowitz quotes from MS documentation in his blog “System Restore in Windows 7 creates a scheduled restore point only if no other restore points have been created in the last 7 days.” XP makes restore points every day by default schedule, so I can see where dropping down from daily to weekly might be problematic, especially on volatile test systems where getting back to a stable state will be easier if users can expect restore points to be less than a week old. It’s good to be aware of this default, and to make changes if it doesn’t work for your needs. 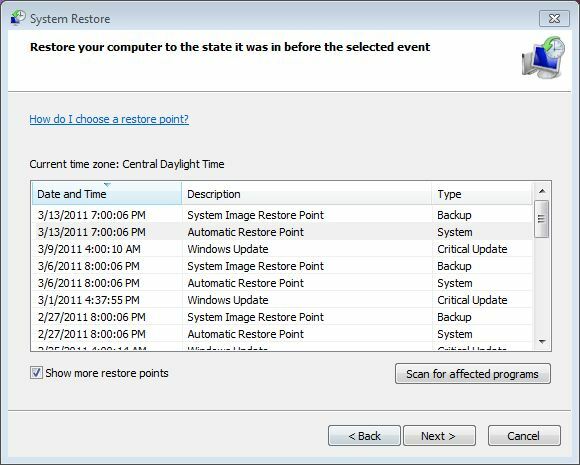 One way to do that is to check out the How-to Geek’s instructions “Change How Often System Restore Creates Restore Points in Windows 7 or Vista,” where you find step-by-step instructions for using Task Scheduler to create Restore Points at a frequency and time of your choosing. Another way to do this is to use some kind of virtualization tool to run volatile OSes, which may then be captured with regular snapshots. When Windows 7 (or Vista) makes an image backup using the built-in backup utility, it captures a restore point at the same time it makes that backup. By scheduling image backups at a higher frequency than once a week, you’re guaranteed to do likewise for restore points. Here’s a screen cap from one of my fairly busy test machines that shows that both automatic and image backup restore points can be collapsed into a single snapshot (see first two entries below). I’ve been messing about with boot/system drive SSDs for over a year now, and I’ve learned to flout conventional wisdom and/or typical advice to turn off System Restore for such drives. Yeah, sure, it means more writes on those drives and probably a shorter lifetime, but I’ve learned the hard way that the convenience and quick fixes that restore points can deliver outweigh the extension to drive life that turning restore points off for SSDs can afford. Besides, I’m pretty sure I won’t be using those drives for more than 3-5 years anyway, and the “10,000 write limit” should last quite a bit longer than that. When it comes to Windows 7 restore points, if you don’t like the default behavior, you can — and probably should — take steps to change it. Then you won’t have to be unpleasantly surprised to learn that your most recent restore point is 7 days old, because you can take steps to ensure it will never be any older than whatever frequency you schedule for restore point creation (using Task Manager, or some other automated scheduling tool) or system image backups (using the built-in utility).